I am very excited when it comes to potty training. For me, it is usually applicable after weaning off bottle and pacifier, which means my baby is not a baby anymore. She’s a toddler! The best time to start potty training may be between 18 months and 3 years of age. At this stage of age, you can read the signs of readiness such as staying dry for at least 2 hours at a time, having regular bowel movements, being able to follow simple instructions, or being uncomfortable with dirty diaper and ask for a change. You can get a special potty that she likes or bring her to the toilet directly and introduce the ‘toilet ritual’. It is important to get your child comfortable with the idea of potty training. Best if you let your child without her diaper or training pants during day time to make sure the training really works. Stay positive, patient and consistent as training takes time and setbacks will occur. Punishing your child if she has problems while potty training will not helpful at all and even makes her less interested in the training. There’s even a toilet training practice called Elimination Communication (EC) in which a caregiver uses timing, signals, cues, and intuition to address an infant’s need to eliminate waste. Yes, it’s infant we’re talking about! EC is quite flexible since you can choose to use diapers as a back-up, or avoid the use of them, or do the mixture of the two. The practice can be done full time, part time or occasionally. This is great as you won’t feel so guilty when you miss her pee. Also, it is applicable to babies at any age, even soon after birth. Do observe your baby’s cry as it may be a sign that she is experiencing some physical discomfort relate to the act of elimination itself. Diaper rash, for example. Whichever method you choose, the key to success is the timing. 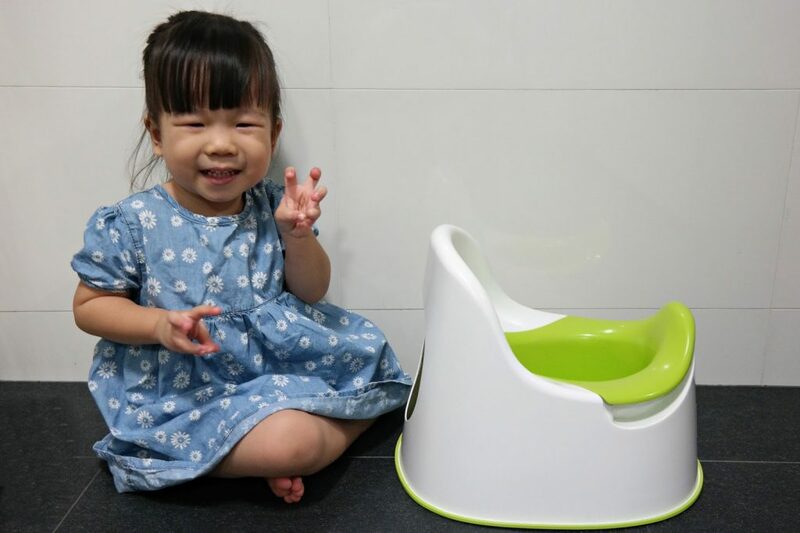 Either you wait until your child shows signs of readiness and letting your child lead the process or when you are ready as a parent to bring your child to the toilet at regular intervals, or combination of the two. Parents are there to facilitate, to guide, to reinforce and to praise, but they shouldn’t put pressure on themselves as they dont’t really control their child’s development.